← 4 Promises and 7 Principles of Forgiveness, But are We Missing the Most Important Foundation? Pierce O’Farrill’s forgiveness of Aurora movie theater gunman James Holmes–within hours of Holmes shooting him–has us all thinking this month about what exactly we mean when we say that we forgive our enemies. As we shared in our previous post, Peacemaker Ministries’ Ken Sande commends four promises of forgiveness, while John Piper draws on three hundred year old wisdom to elucidate seven forgiveness principles. But we left off last time with the distinct sense that we were missing something very foundational. Automatic forgiveness on the part of Christians is common. From Oklahoma City to Columbine, some rush to forgive regardless of whether or not they were victims. And, some forgive even if the offender does not repent. However, well intentioned, such automatic forgiveness is misguided. Not only is it inconsiderate of the families of victims, it also undermines a proper understanding of the justice of God and the integrity of grace. Alternatively, Romans 12:17-21 summarizes three guidelines for a proper Christian response to evil. First, Paul admonishes his audience not to take revenge. He repeats this point three times (Romans 12:17, 19, 21). Virginia Tech victims cannot respond with vindictive hatred towards Cho Seung-Hui, his family, or others they believe are responsible. Revenge is not an option for Christians. In a second guideline, Paul tells Christians to authentically love all people. “Let love be genuine . . . If possible, so far as it depends on you, live peaceably with all (Romans 12:9,18).” Amish families exemplified genuine love when they offered financial assistance to the family of their daughters’ murderer. Overwhelmed by such love, the widow of the shooter, Marie Roberts responded, “Your love for our family has helped to provide the healing we so desperately need. Your compassion has reached beyond our family, beyond our community, and is changing our world.” It would be an act of stunning beauty if Christian victims reached out lovingly to the family of Cho Seung-Hui. But, the third guideline Paul offers is that Christians should, “Leave room for the wrath of God.” Indeed, this is why Paul argued that Christians should refrain from revenge. Christians can rest in the certain truth that God will accomplish perfect justice. Such a confidence in the justice of God guards Christians from the bitterness that poisons those who believe it is their job to retaliate. Paul later shared with Timothy how he put this truth into practice. “Alexander the metalworker did me a great deal of harm. The Lord will repay him for what he has done. You too should be on your guard against him . . . (2 Timothy 4:14-15a).” Paul does not say he forgave Alexander. Neither is he bitter. He trusts God for justice. If, as Paul notes in Galatians 2:20, it is no longer we who live, then have we not become intentionally conspicuous devices designed to attract attention to Christ Jesus? If, as Paul notes in 2 Corinthians 5:20, we are Christ’s ambassadors, then is not the forgiveness to which we are to attract attention the forgiveness of Christ? Which statement does that more fully, more Scripturally? 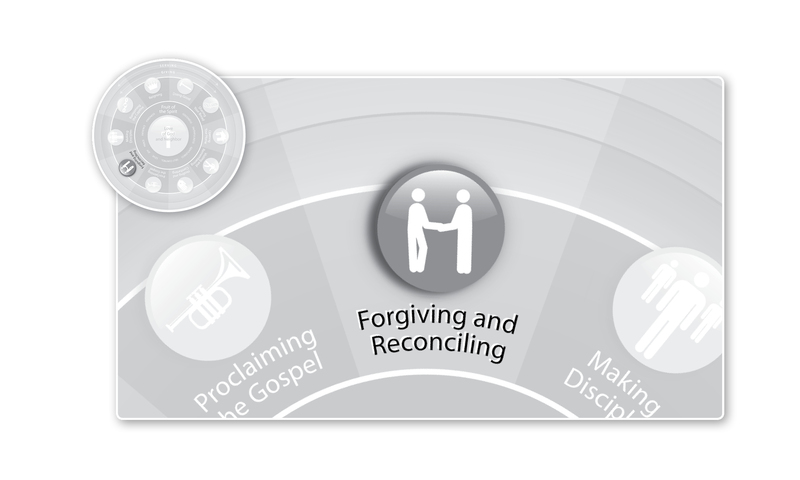 The fundamental principle of forgiveness, in other words–the principle preparatory to four promises, seven principles, and every feeling of pity, empathy or lack of anger we may feel toward those who wrong us–is that the most precious forgiveness to which we are to orient the world (and to which we are to continually re-orient ourselves) is Christ’s forgiveness, not our own. We are to join Jesus, Paul, and Stephen in praying publicly to God that he may forgive our enemies, and when we do so we are ambassadors not of our own reconciliation but of Christ’s. It is his alone to offer, and ours alone to publicly request. This entry was posted in Forgiving and Reconciling and tagged automatic forgiveness, James Holmes, Peacemaker ministries, Pierce O'Farrill. Bookmark the permalink. I confess, Rev. Foley, to being a bit uncomfortable with some of the above. Not because it isn’t correct in as far as it goes, but in it’s incompleteness there is a danger of both a Docetic understanding of spiritual maturity and a tendency towards a scholastic dissection of the topic, both common weaknesses in Western theological work. Better to see the principle of “apatheia” and the spiritual virtue of humility in the Fathers to understand how we believers deal with the challenge of forgiveness. Also the re-discovery of modern Evangelicals of the need for penance and fruits of repentance is admirable, but divorced from a robust and ontological Eucharistic ecclesiology this often does devolve into mere rule keeping and individualistic self-righteousness. Keeping the “unity of faith in love” is the hard work and witness of that “city set on a hill” and has been for 20 centuries. The authors mentioned above make comments concerning this or that passage with absolutely no indication that they have any connection or even awareness of the massive volumes recorded by holy men and women through the centuries. This glaring omission strikes those of us who attempt not to ignore the work of the Spirit through the centuries as at the very least naive. This is not a “new” topic after all. This seamless robe of theology demands we seriously dismiss all attempts at reducing our hearing to only these “modern” voices; not because they are “wrong” or “flawed” but because they are profoundly incomplete and this very incompleteness is fertile ground for all kinds of heresy and misrepresentation of the Gospel. Diligently pouring over the pages of Holy Scripture, searching out this or that principle or insight is admirable as far as it goes, but all too often it bears the air of disembodied personal self-help. In the end, I have come to not depend on spiritual insights of those still on this side of death. Finally, the last comment in the article strikes me as again leaning toward a Docetic notion of the Church. What did St. Paul mean when he declared we are “in Christ?” If this is truly the case then “His alone” and “ours alone” become both confusing concepts and potentially misleading insights. His forgiveness IS my forgiveness; His reconciliation IS my reconciliation, else how are we ontologically and authentically the Body of Christ. Christ is one; two natures, one Person. Please forgive me. No offense is intended. Only the hope of continually sharpening the iron of my own soul. Always so good to hear from you. I suspect there are few subjects that would benefit from more attention in our time than the subject of forgiveness, so I am grateful to the Lord that you would take the time to share your thoughts. While it sounds like you and I are perhaps of slightly different opinions as to whether the writers in the post write in a way that is deeply rooted in scripture and church history and is consistent with the counsel of our Christian forebears, you and I both agree about the value of such counsel and the tremendous benefit of hearing it anew. To that end, I would be absolutely delighted to have you write a guest post this month on a figure from your tradition whose thoughts on forgiveness are little heard and much needed today across the whole church. I think a guest post like that, even more than a theological comparison or cross-tradition evaluation, would so well embody the principle of “apatheia” and the spiritual virtue of humility that we want to make sure is central to our focus on forgiveness in the blog this month. Would you be willing to write such a guest post and email it to me? AS usual, your graciousness throws into stark relief my arrogance and pride. Serves me right! I would be honored to write a guest post, if only to display my weaknesses to you and to further my own humiliation. I will have something composed for your private attention and to leave to your decision as to its value in posting. How wonderful, Fr. Barnabas! I’ll look forward to receiving your correspondence and guest post. Permit me to reassure you that I have received each of your posts in the warmest spirit of Christian brotherhood, been quite edified by our ongoing relationship, and am looking forward to more of the same. Thank you, Pastor Foley! Another well written and encouraging post! And thank you for another encouraging reply, Pastor Ryan! May the Lord bless all to which you put your hand in his name today.